Who doesn’t love Costco? It’s like the Disneyland of grocery stores, I weirdly get excited every time we have to go pick up some things. Costco has great deals, from travel (how we went to Mexico on a budget) to furniture (got our couch there for a steal), electronics (got our TV there for a killer deal), clothes (they have the best comfy travel pants), and of course food! In my opinion, Costco has really stepped up their game in recent years, providing all sorts of awesome healthy foods and products for a great deal. Here is my list of things I buy and use most often. If I’m missing something you love from Costco, let me know in the comments! Fresh raspberries- I LOVE fresh raspberries and it’s hard to find a better deal for a larger container, especially here in Utah. Salad kits- A great and easy way to get in some greens. I like the Kale and the Mediterranean crunch chopped salad kits. Spinach – a must for my green smoothies. I usually freeze half and use that for other dishes. Maya Kaimal Indian Curry- I love curry, whether it’s Indian or Thai. These Indian curries are delicious, simple ingredients and all you have to do is throw in some protein (we love shrimp) and veggies for a yummy meal. Chicken Tortilla Soup- Yummy, quick and easy, and clean ingredients. Cage-free eggs- I like to choose cage-free as often as possible. We’ve found Costco has a great price for cage-free eggs. Unsweetened coconut milk- great for smoothies! Riced Cauliflower- Sometimes I like to mix it up and I like this in place of normal rice for my curry dishes or with lentils. Mixed Tropical Fruit Blend- I use this in my green smoothies all the time! Kodiak Cakes- I love the buttermilk and dark chocolate flavors when they do a special. The Kodiak syrups are also incredibly good, although not the healthiest. Pure Maple Syrup-Obviously good on pancakes/waffles and I enjoy using pure maple syrup in baking as an unrefined sugar substitute. Daves Killer Bread- My favorite bread. Packed with protein, fiber, and omega 3s. We usually keep one loaf in the fridge and freeze the other one. Local Raw Honey- Raw honey is SO good for you and has so many health benefits. It’s my favorite unrefined sugar substitute. We have local options here in Utah, but Costco has their own brand too. Almond flour- I LOVE baking with almond flour. It has a similar consistency to wheat flour but is less processed, has fiber, healthy fats, rich in vitamin E and magnesium, and is lower in carbs ( if you’re counting.) It’s also gluten-free if you don’t do gluten. Hemp hearts-Love these tasty little guys to add plant protein and omega 3s to my smoothies and other recipes. I prefer the consistency to chia seeds and you don’t have to grind them up to get the benefits like you would flax seeds. Tasty Bite Madras Lentils- I eat these ALL THE TIME. These are a great source of fiber and have some protein too. They have simple, clean ingredients and are so good with either rice or riced cauliflower, cottage cheese, and a little sriracha. Don’t hate it till ya try it. Lotus Foods Rice Ramen- We love Asian dishes at our house, so we love these brown rice noodles to switch it up instead of just using rice all the time. Gluten free and vegan too! Pacific Foods Organic Red Pepper & Tomato Soup- Love this soup with a side of cottage cheese toast! It’s a little higher in sugar (as most tomato soups are) but it’s also got 6g of protein and easy for a quick meal. Pacific Foods Organic Bone Broth- I love using bone broth for a base in soups, especially homemade chicken noodle. Basically, any soup base that calls for chicken broth you can use this chicken bone broth and you’ll add more protein, collagen, and nutrients your body craves! Vital Proteins Collagen Peptides- This is one of my favorite collagen brands (another favorite is Ancient Nutrition) and you probably won’t see a better price point for such a large tub. I add collagen to all my smoothies and lots of my baking recipes too! Orgain Grass Fed Protein Shake- These have been my go-to breakfast lately, I love them! They are cleaner than most ready to drink protein shakes and I think they taste 100xs better too. No weird clumping or texture and a great amount of protein. Kirkland Adult Gummy Vitamins – These are my everyday vitamins. I prefer gummy vitamins because they are absorbed better and easier to take every day. (Anyone else hate swallowing pills?) I love the taste and I love that it comes with two containers, one for me and one for my hubby! Kirtland Chewable Vitamin C- I ALWAYS keep Vitamin C on hand to help with immunity and fighting off colds. Again, I prefer the chewable ones because they are easier to take. That’s pretty much it! 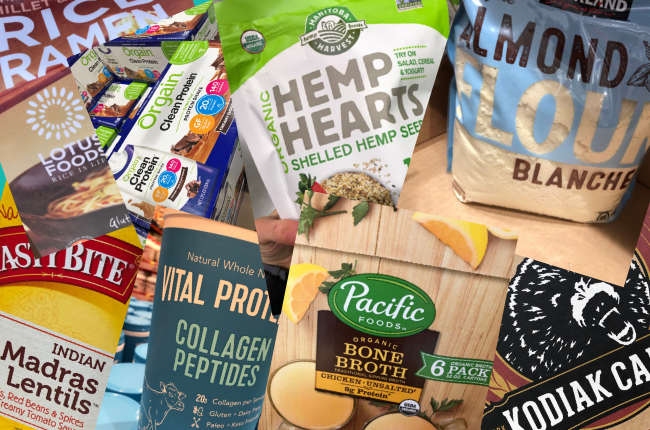 These are the healthy Costco products I use the most often and think they are fairly priced. Let me know your favorite Costco finds in the comments!